Honestly, I’m not entirely sure of the day, but it’s late Thursday night in Liverpool as I write this. 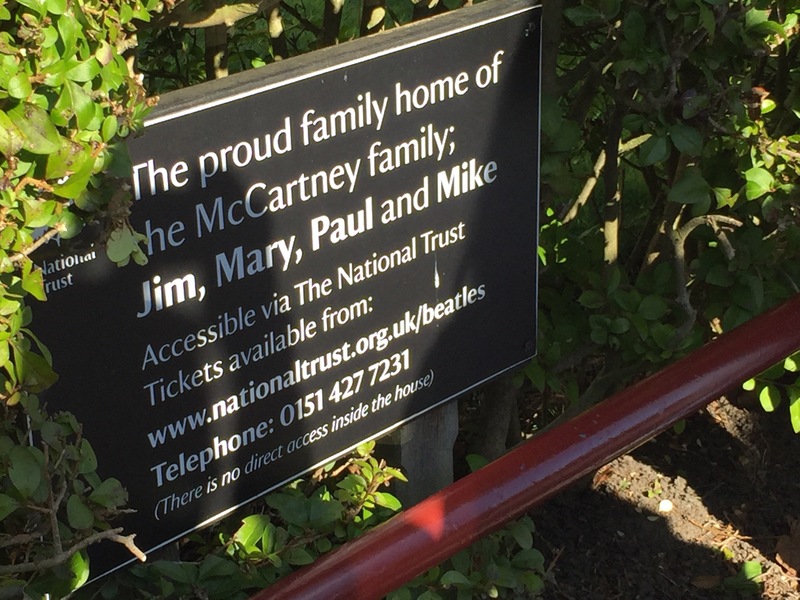 After a hearty breakfast of two cappuccinos, toast and fruit, we headed off on the National Ttust Tour to see Mendips (John Lennon’s boyhood home) and Paul McCartney’s boyhood home. What a treat! We got full tours of the houses and gardens and were invited to take a sprig of rosemary from Paul’s home. Marilyn and I are both carefully nursing our sprigs in water in the hopes of transplanting them when we get home and having honest-to-goodness McCartney rosemary in our gardens. I generally have a black thumb but hers is quite green, so we have a 50/50 shot! If mine dies, I’ll make a one-time batch of spaghetti sauce and call it done. Guests were invited to play piano at Paul’s home (note the first name basis…we are practically BFFs) and I played The Entertainer. [Shout out to my Armstrong Elementary piano teacher, Ms. Reynolds! 40 years later, I’ve still got two songs committed to memory.] 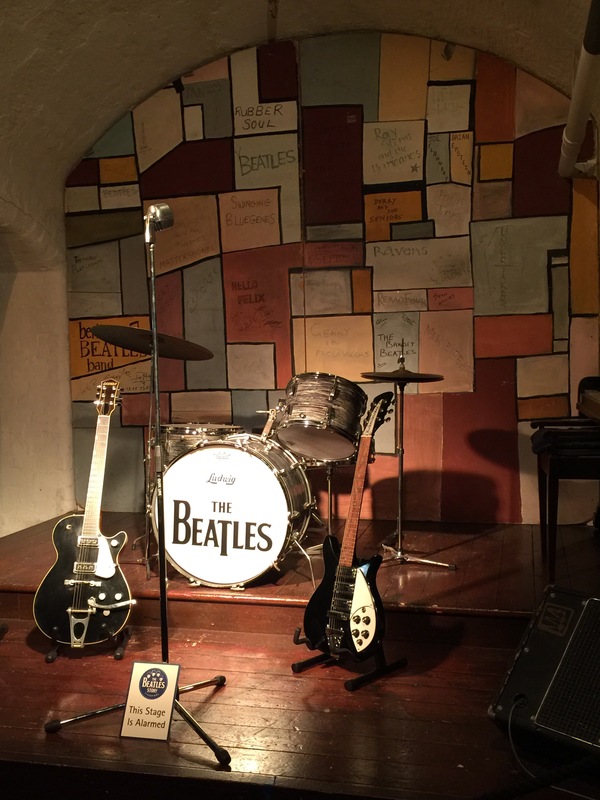 While it’s not Paul’s actual piano, many famous musicians have come through there and sat to play it. Jackson Browne, Bonnie Raitt, Deborah Harry, and others I am now forgetting. No doubt they sounded much better than my rusty Entertainer! 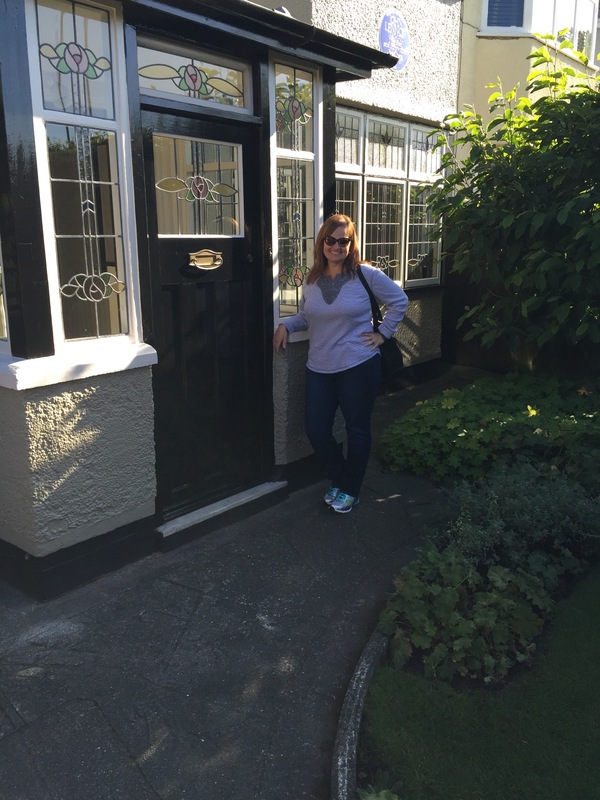 After the home tours, we went to The Beatles Experience – an amazing museum of photos, memorabilia, recreated pub sets, etc. 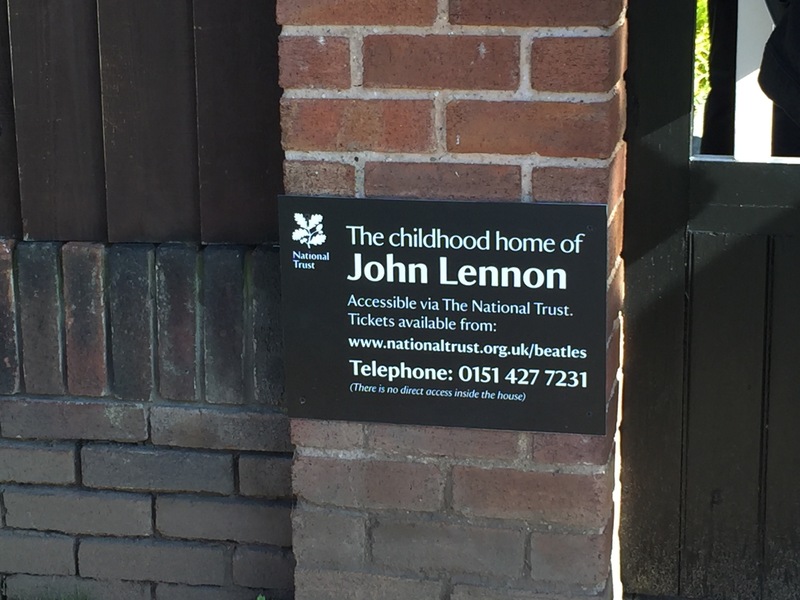 Through an audio tour, we experienced the rise and fall of the Beatles. It was information overload for sure! Half of the group went to a club after dinner but a few of us decided we were tired and would skip out. We are walking 3-4 miles most days. A shock to my poor body but good for it, too. My heel has not been terrible, so I consider that a win! Our group is a lot of fun. 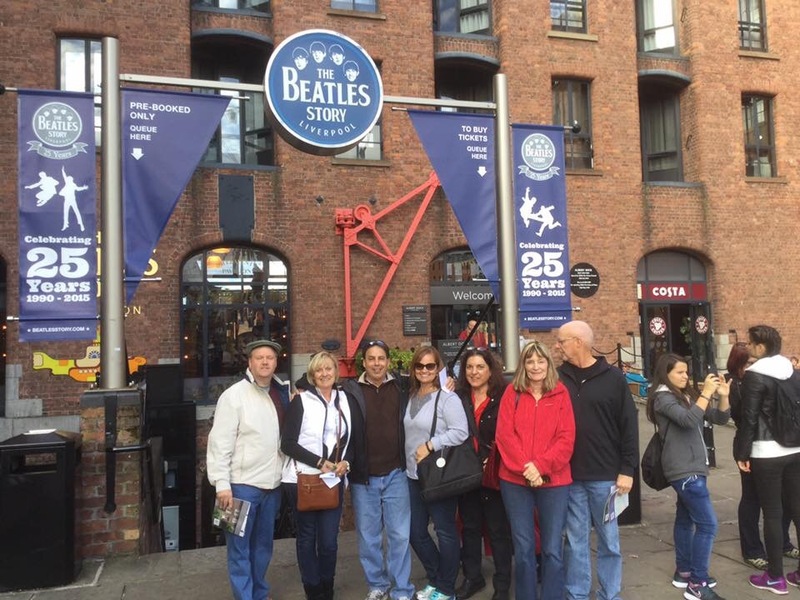 There are 12 of us: three married couples, two singles, a mother and teenage daughter, Marilyn and myself, and our http://www.beatletour.com guide, Tony. The mother/daughter are from Canada; one couple is from Chicago, and all others from the NE – Philadelphia, DC, New Jersey, and…somewhere else up that way, I believe. We all have a good rapport and we remind Tony often how lucky he is to have such a good group! It’s all in jest because truly we are the lucky ones. 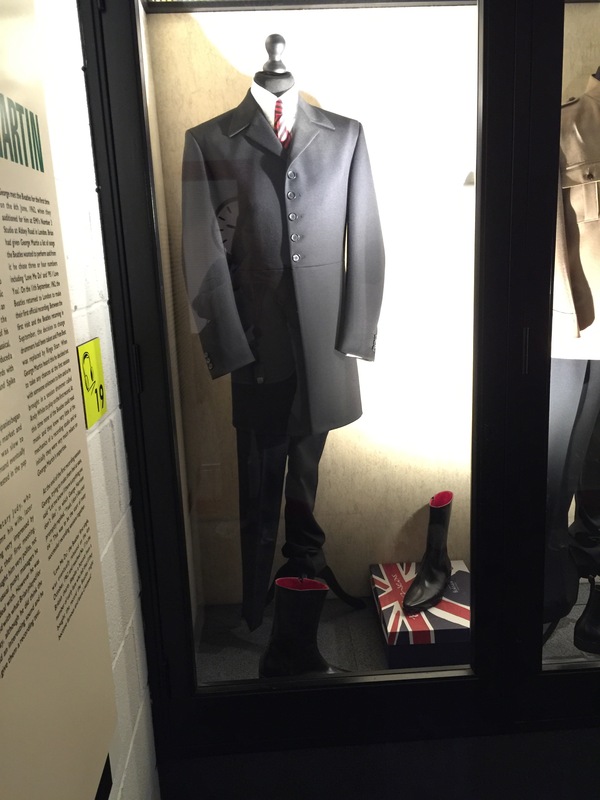 The tour is well organized and includes a lot of interesting tidbits that have been carefully compiled to add to the experience. I’m not one to go ga-ga for celebrities because I generally believe they put their underpants on one leg at a time, get zits, and poop like the rest of you, I mean us, but it interesting to learn more about their lives, the struggles they had that turned them into the stars they became, and see the homes where they grew up. They are places from the 1940’s, the era I would have chosen to be a housewife if I had my druthers. (A 1940’s wife with an iPhone, I mean.) An antique chenille bedspread is lovely enough to make me want to weep. Throw in a clothesline and I’m a goner. But I digress. Tomorrow: a full day bus tour and then headed to the theater to see “Let it Be.” It will be a long day but promises to be very good. Assuming I get some sleep soon. Maybe my brain will soon get the memo to stop thinking! Not even bothering with the pictures anymore. The hotel is fabulous but the wifi refuses to allow me to do anything with pictures. Go figure. Oh sounds wonderful! Did you learn about them playing gigs in German strip clubs? I love that story! Fabulous!!! Keep that rosemary sprig in a glass of water. I don’t know if it will make it though customs or not, but there’s a good chance. Rosemary is very hardy! Glad you plantar fasciitis isn’t too bad!